The Wesleyan Chapel in Cookham High Street was built in 1846. A simple structure of brick and slate, it could accommodate a congregation of up to 107. Stanley Spencer attended the chapel with his mother whose brother had been a local preacher there. 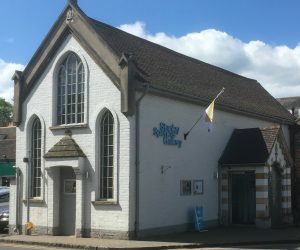 The services made a deep impression upon the young artist and he felt a great spiritual significance within the little building, so much so that over thirty years later he was able to recall it in great detail when drawing Ecstasy in a Wesleyan Chapel which is now in Gallery’s collection. 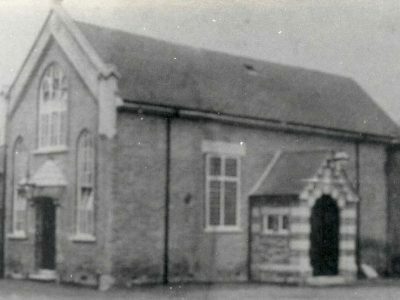 The chapel became underused once a larger Methodist Church was built in nearby Cookham Rise in 1904 and eventually closed, much to the chagrin of the Spencer family who fought hard to keep it open. Stanley’s brother Gilbert Spencer recalled On April 17th 1910 Stan and I saw the key turned in the door of Cookham Chapel for the last time after the evening service. And with this, I think an important and significant influence in my brother’s life came to an end. The building was then converted by local benefactor Colonel Ricardo into the “King’s Hall”, a reading and recreation room for village residents, and continued as such until the Second World War, after which it was used for various activities, including a life drawing class suggested by Stanley Spencer. After Spencer’s death in 1959 Faith Gibbon, a young artist whom he had befriended, was using the former chapel as a studio. She invited the steering committee of the newly founded Stanley Spencer Memorial Trust to visit her, at which point it was decided that the perfect venue for The Stanley Spencer Gallery had been found. A simple conversion took place; the side windows were blocked in to allow more hanging space and a new floor, doors and lights were installed. In 2006/7 the building was completely refurbished at a cost of over £800,000 thanks to the Heritage Lottery Fund and was reopened on 29 September 2007, creating a modern, light space which displays Spencer’s works to their best advantage. A mezzanine floor was added and new state of the art equipment installed in a sympathetic renovation which reclaims the simple beauty of the building which Stanley Spencer so loved.